Availble for home or office visits or appointments at convienent locations. 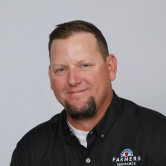 As your local Farmers® agent in Exeter & Visalia, CA located in the Central Valley, I make the insurance process as convenient as possible. I will go the distance working hard to satisfy the needs of my clients & providing the quality of service you expect from an insurance professional –whether that’s auto insurance, homeowners insurance, renters insurance, property insurance, motorcycle insurance, commercial insurance, life insurance, business insurance, flood insurance & more. Come see me at my office in Visalia, or I can meet you at a location in Exeter, Farmersville, Goshen, Ivanhoe or another location in San Joaquin Valley that is more convenient requested it when we schedule a meeting. Give me a call at (559) 234-2434 and I'll be happy to answer any questions you might have. As your local Farmers agent in Visalia, I can help make you smarter about insurance.